State Rep. Christian Mitchell Chicago Tonight has learned of a new proposal from state lawmakers to provide a $200 million windfall to Chicago Public Schools as the system deals with a half billion dollar funding shortfall. This, as CPS announces that non-union employees will start paying their full pension contribution. Is this a not-so-subtle message to the teachers union that they will soon have to follow suit? We’re told that State Rep. Christian Mitchell, a Democrat from Chicago, is going to introduce a bill that proposes a “cost shift,” meaning all downstate and suburban school districts would pay their own teacher pension costs – as opposed to having the state pay those costs, as it does now. Chicago already pays its own teacher pension costs, as Mayor Rahm Emanuel and Chicago Public Schools CEO Forrest Claypool have constantly reminded state lawmakers – so this would create pension parity – in the opposite way that Emanuel has asked for. Mitchell and Ald. Will Burns (4th Ward), who is supporting this effort, say all of the billions that the state saves by offloading paying for pensions will be plowed right back into education funding, resulting in a $200 million windfall for CPS every year – the same amount that Senate President John Cullerton and Gov. Bruce Rauner have both offered to have the state pick up in separate proposals of their own. 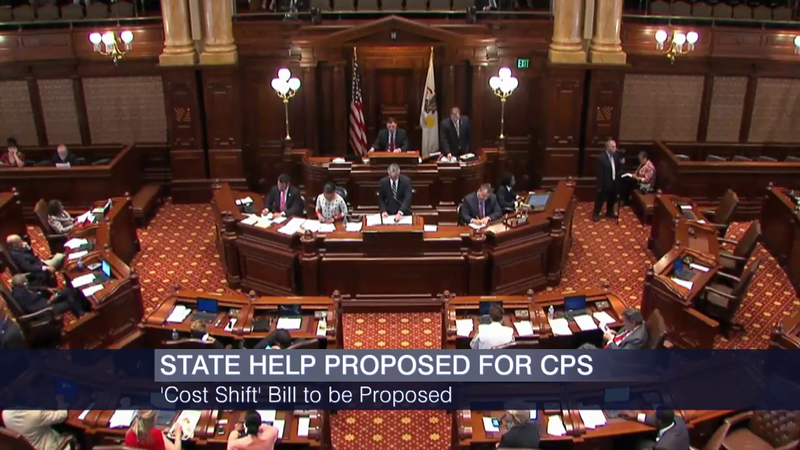 The “cost shift” is something that House Speaker Mike Madigan has called for over the years. Mitchell and Burns will announce the new legislation at a news conference tomorrow. Today’s news comes at the same time that CPS announces it will end the controversial 7 percent pension pickup for non-union employees, but not members of the Chicago Teachers Union. It turns out all CPS employees have had 7 of their 9 percent employee retirement contribution paid for by taxpayers. Today, Claypool announced that that would end for 2,100 non-union employees and save millions that the district can put into education. It would be phased in where employees that now pay 2 percent would this fiscal year pay 4 percent; next year, pay 6 percent and then in two years pay the full 9 percent, saving the district $11 million. “A 7 percent pay reduction for city’s public school teachers is still unacceptable and still strike-worthy, even if done in phases … it still amounts to the same thing, a pay decrease at a time when workloads have increased by more than 20 percent." Last night on Chicago Tonight, Karen Lewis didn’t close the door on phasing out this pickup, but indicated it would probably have to come with a pay raise, and that she’d have to take it to her members.